People who visit Oak Hill are often surprised by the weediness. (That's a word, right?) Most don't say anything, but I know they're thinking it. You won't find a beautifully manicured lawn here. In fact, we never planted grass; this used to be a cattle pasture - and unfortunately I think the best Bermuda grass on the place grows in my garden. Those who do mention the weeds are reminded that “a weed is simply a plant you don't know what to do with.” Most – maybe all - weeds are beneficial in some way: some are medicinal, others are edible, some are important for pollinators, and still others improve soil health. And nature abhors a vacuum, so if you're not growing something on purpose, you'll end up growing other things on accident. Our “lawn” includes curly dock, wild onions, dandelions (my dad would be appalled! ), both narrow- and broad-leaved plantain, shepherds purse and many other “weeds” as well as native grasses. We mow it all down to make it look semi-civilized. What we mow down goes in the compost pile. The good part is that we don't have to spend a lot of time or water maintaining our “lawn” other than keeping it mowed. It survives our hot, dry Oklahoma summers, although it does get a bit crunchy at times. Hubby's riding mower and my self-propelled mower don't reach right up against the fenceline and into the corners, so the weeds thrive there. But I have to admit that I rather like the wild edges, and I let them grow on purpose. Those weeds are nutritious treats for my goats and chickens. My chickens love chickweed in spring and the seedy stalks of curly dock in the fall. The goats love... well... all the plants except the grass. I'd love to have a huge pasture for the goats, but we don't have the right fencing for that. Barbed wire and goats don't mix. So they keep their enclosure neatly trimmed, except for the grass. 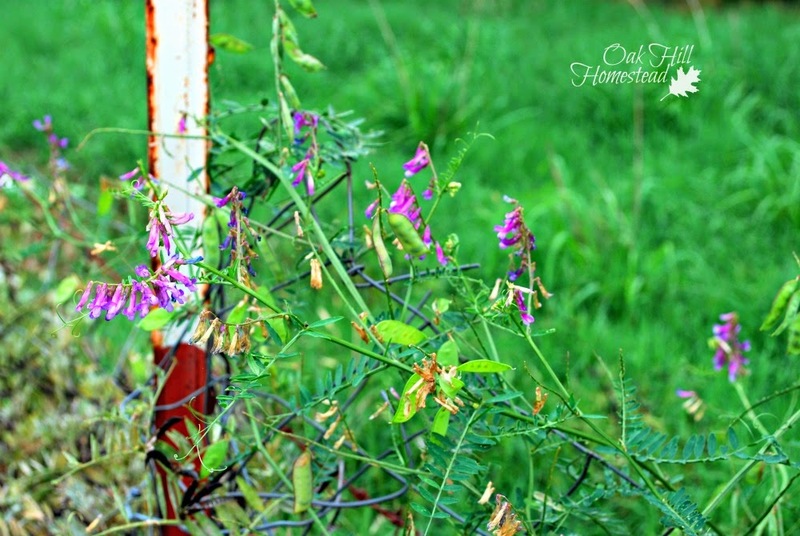 Right now the vetch is growing up the fences like crazy. It's an attractive plant with pretty purple flowers that bloom in spring. It grows wild here, but you can buy seeds for it; it's grown as a cover crop, as pasture, and to prevent soil erosion on roadsides and steep banks. 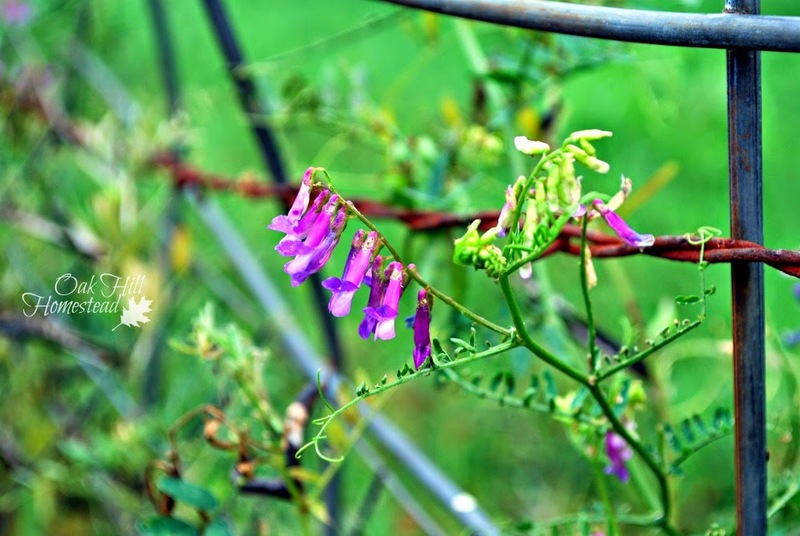 Vetch is a weak vine that climbs up other weeds and along fences. 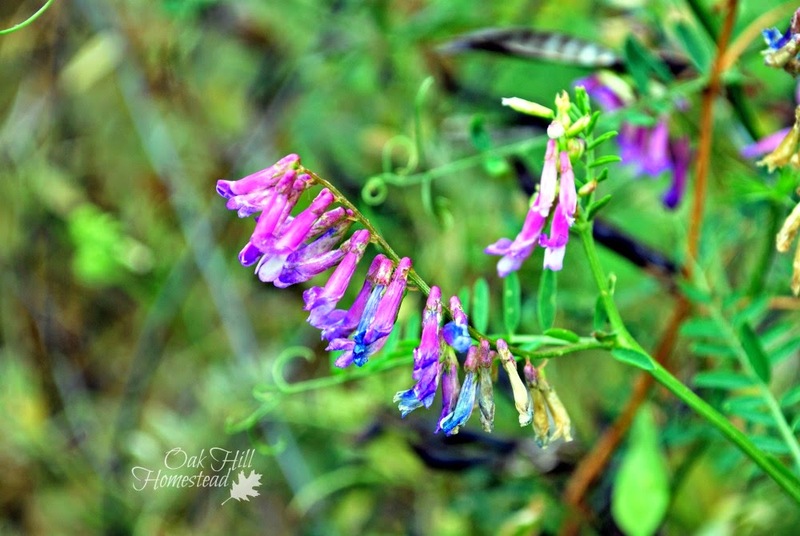 As well as growing on our fenceline, there are several patches in our pasture, down the road and along the highways, where its purple flowers against the green foliage are a pretty sight. Without something to climb, vetch can reach heights of about one foot, but grows much higher with a form of support, such as a fence. The flowers are small but I think they're showy. The branches have curly tendrils that find and cling to fences and other plants. 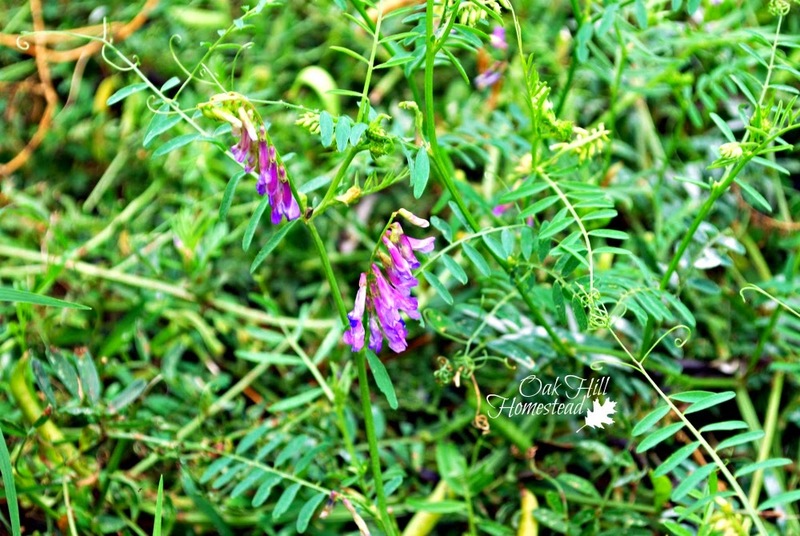 Hairy vetch (Vicia villosa) is a legume that's related to peas and beans. Like its pea and bean relatives, vetch fixes nitrogen in the soil by converting nitrogen in the atmosphere into a form the plants can use. 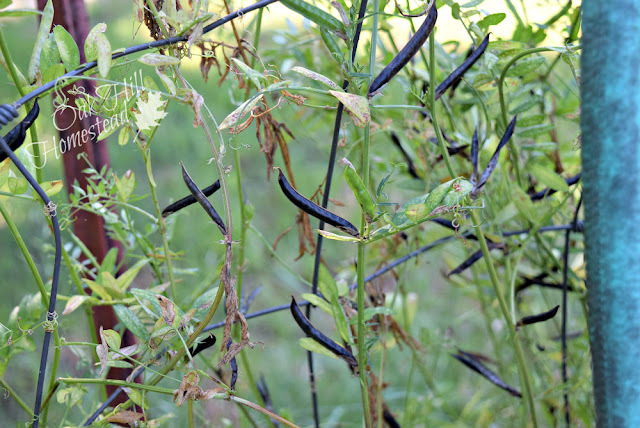 This article in the Washington Post even talks about growing vetch as a cover crop before planting tomatoes, promising healthier and higher-yielding tomato plants. 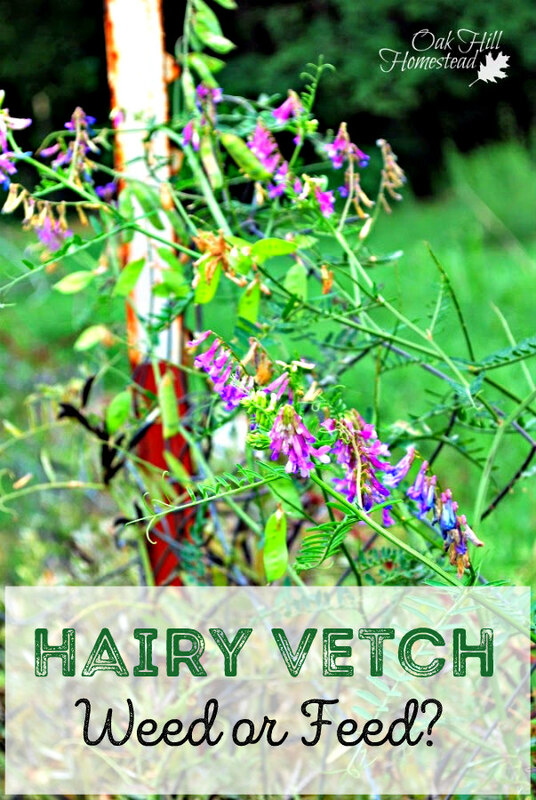 If you're interested in growing it on purpose, you'll find planting instructions for hairy vetch in this article by Gardening Know How. Subscribe to The Acorn, Oak Hill Homestead's weekly-ish newsletter. 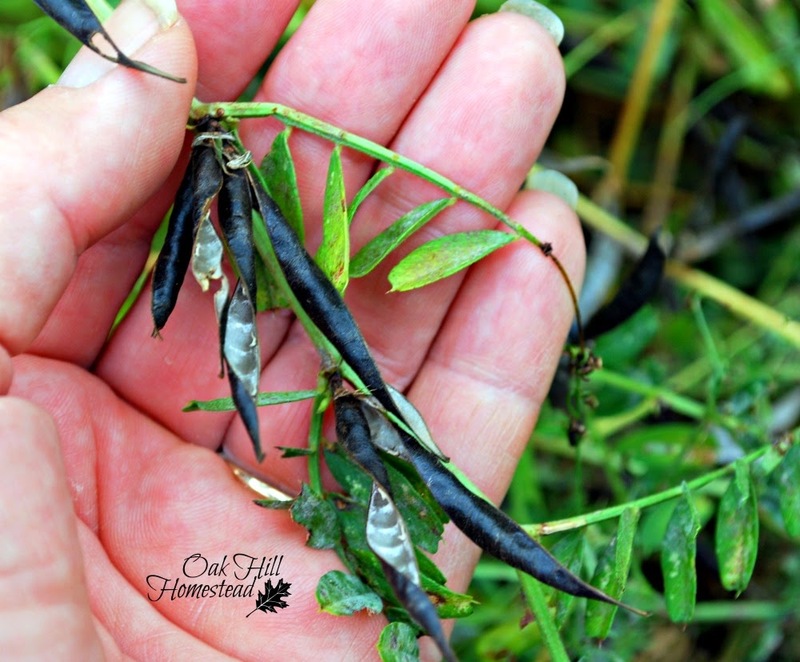 Later in the season, the vetch dries out and the seed pods turn black. Supposedly the leaves, shoots and pods are edible by humans and livestock alike, and taste rather like peas. They can be eaten raw, but most of the information I read online says that they are also good when steamed for five minutes or so, like other leafy greens. 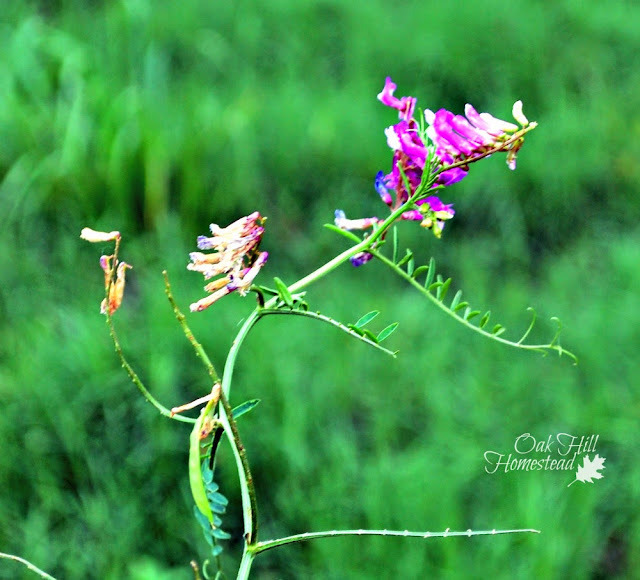 Vetch is grown in many areas of the country and makes a high-quality hay when grown alone or mixed with small grains. It can also be used in grazing, although it is best used in a rotational grazing setup since it doesn't tolerate being grazed close to the ground very well. But besides being pretty, I let the vetch grow so I can feed it to my goats. The protein value of vetch is just slightly lower than that of clover and alfalfa, and my goats absolutely adore it. I gather it by the armful and toss it over the fence where the goats are anxiously waiting. They know that when I'm pulling weeds, they're going to get something tasty! 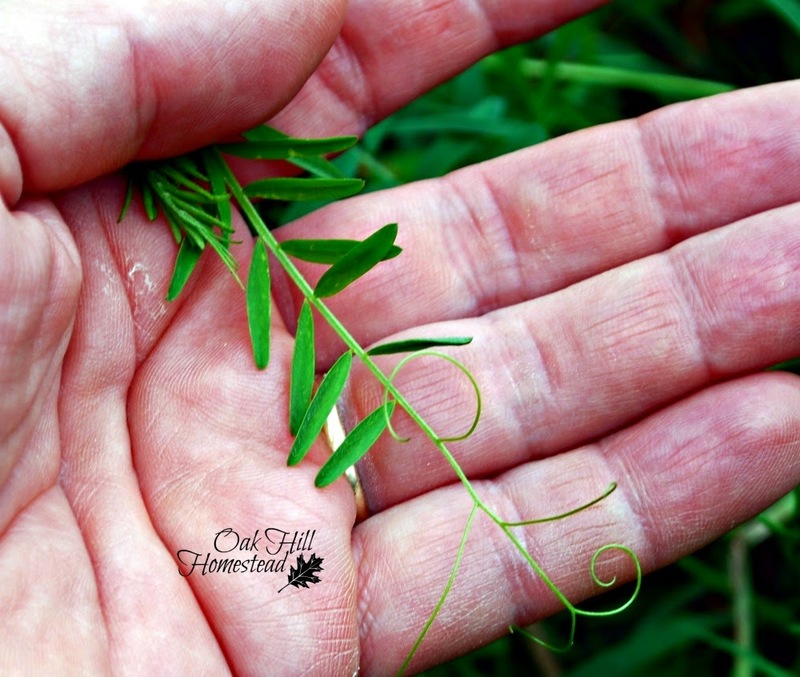 Do you forage for your chickens or livestock? Yes, cows love it too! I do forage for my chickens. And I have seen vetch growing in the field across the road. I'll have to try bring some home to see if they like it. Thanks for the tip!